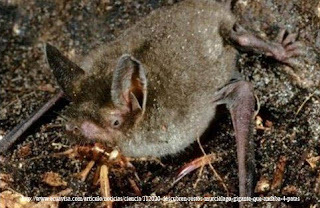 Mystacina miocenalis is a recently discovered extinct bat from New Zealand. It was described this year. As some of may know there are no native mammals in New Zealand except a few species of bats. This had lead to the evolution of many flightless birds. Apparently there was a bat which may have been well on the way to flightlessness. The bat was three times heavier than its closest relatives and you would think that the whole point of being a bat is flying, but these guys apparently walked on their strangely modified limbs. These characteristics have earned it the nickname batman. Bayman is known from a single cave on the South Island of New Zealand (the batcave, obviously). It is about 17500 years old.